What a lovely wrap! Thanks for the tutorial. Looking forward to trying this! What kind of volumizer are you wearing here? I didn’t quite catch that, and I’ve found a VolumeEZ to be too small for my head. It’s a new one that I am trying out – you will find out the source soon! Your blog makes me super excited to cover my hair when I get married. Thank you for this and all of your Amazing tutorials!!!! I’m interested in the new volumizer that you mentioned too!! I’ve been looking at them but haven’t committed yet. I do have a ton of hair but it’s unpredictable and you never know how it will lump or where it will sag. It seems like the volumizers are consistent and that’s what I’m looking for. I think it’s the main reason your wraps look better than mine. I do it like you do but it’s messy looking and I’m struggling with too much bulk. I’m looking into finding a cap that doesn’t have extra volume added for ladies like you! I meant to add that I do love the criss-cross. It’s very, very good!! Love it! You are so lovely! Thanks for sharing your newly created technique! beautiful as usual!! I am glad that you showed us how. I was thinking of doing this myself as I do something similar with a square scarf and a rectangle scarf that I learned from The Style Underground. Lovely scarves also. Love this….Thanks for the video! Beautiful. Also looks similar to what the Sikh women in my area wear, but they stick with white. I watched this at the gym this morning before work because I just couldn’t wait until my lunch break. Andrea, this is gorgeous. Can’t wait to try it for shabbat. It is stunning Andrea! Thanks for showing us. Oh Andrea, it looks amazing!!!!! I love it, thank you so much! 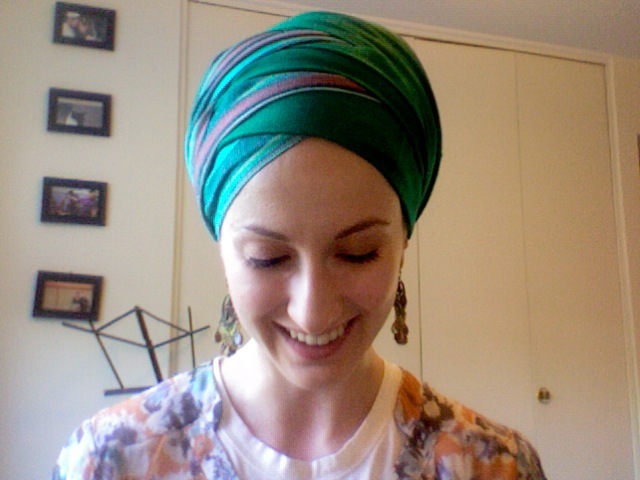 A comment from a non-Jewish woman who is covering because of previous hair loss (that has now turned into a love for head wraps despite having hair again; I wrap my head about every second day! ): I cannot enough recommend the volumizers! I have a few; I got one from Judith de Paris, one from Sara Attali Designs on Etsy (awesome shop, really nice tichels too and gorgeous tichel pins!!! 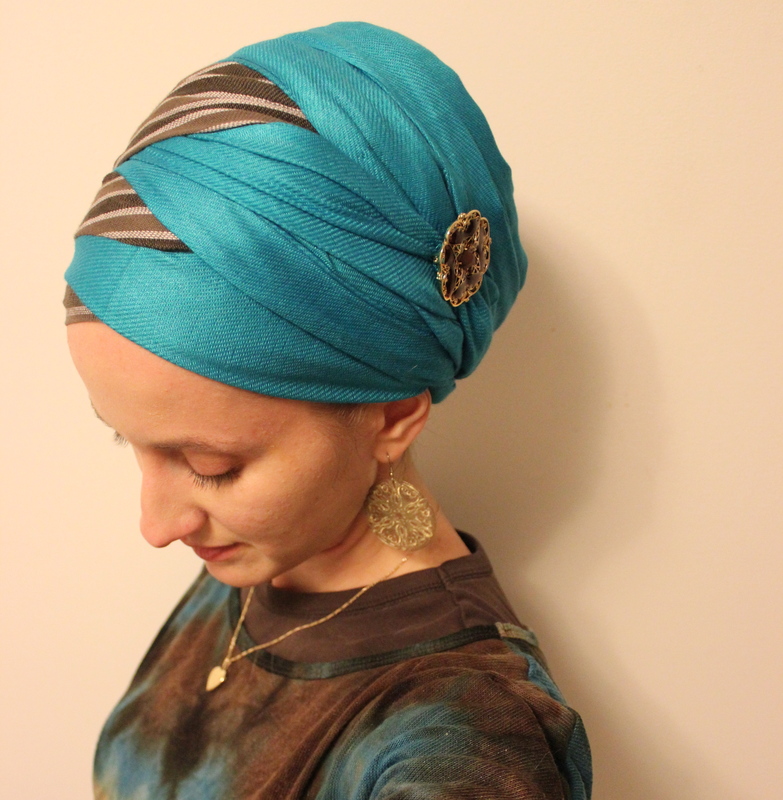 ), one from myheadcoverings.com. They are slightly different height but I love them all. Also the velvet headbands change EVERYTHING!! The scarves really don’t slip. Thanks Jenny!!!! I’ll go look at those. I have been patiently waiting for this video (read DYING with IMPATIENCE!). Thank you so much for providing the video! I followed step by step and it worked on the very first attempt. hi what is the name of the cap you used under the hijab? It’s called a shaper and can be found on wrapunzel.com ! !